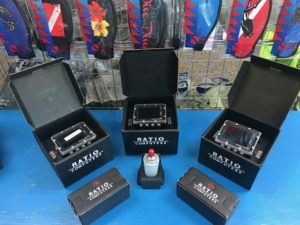 After 3 years of trials and fine tuning the long anticipated RATIO PRO and RATIO GPS Dive Computers were delivered to us today. Easy: A great dive computer that’s easy to read in both 21% and Nitrox modes. Has a Digital Compass, both Sound and a Vibration Alarms, the ability for Air Integration as well as an external Oxygen Analyser. The Ratio will read, calculate and run on mixed gases down to the decibel. Side Note!!!!! The Air Integrated Transmitters are Green when reading a full tank of air, Turn Yellow at about 1000 psi and Red at 500 psi….. How Cool Is That!!!!! Deep: Adds the software for (18% Oxygen and up to 50% Helium) or Trimix. Tech+: Adds a CCR or Rebreather mode, the software for (5% Oxygen and up to 95% Helium), Plus up to 10 different Gas settings. Can read up to 10 different transmitters at once, GREAT for an Instructor and Students. Easy, Deep, Tech+ and REB. All 4 models add Bluetooth capability and GPS software. So you can return to the coordinates of specific dive sights, mark your entrance, dive all around, push the return button and your built in compass will point you back to your starting position. Come on in and check out the RATIO….. The last Dive Computer you’ll ever want or need.